Cabo Gold Tequila Blanco - Cabo Gold is produced by Agave Tequilana, which is a company rich with experience and tradition in both, the cultivation of Agave and the production of fine Tequilas. Cabo Gold Tequila Blanco is 100% Blue Agave and is bottled directly after distillation, with the addition of 24k Gold Flakes. Gold Flakes in Liquor is not new, but Cabo Gold is one of the first Tequilas with 24k gold flakes! Although some think that the practice of "Gold" in the drink comes from the ancient Egypt, in the later years "Gold" was introduced into liquor by "Gold miners" that had struck it rich during the Gold rush of the mid 1800's in California. A miner that had just hit it big on his Gold claim would sprinkle flakes of gold into his liquor pretending to be of high Royalty! In the 20th century, Gold is used to relieve the pain of Arthritis. So if you find yourself in need of relief from Arthritis pain, have yourself a shot of Cabo Gold Tequila. Pleasantly surprised, a unique aroma and flavor! I don't want to sound like I'm writing this tequila off right away, but I don't understand the trend of crap floating in drinks. Cabo Gold Blanco has little gold flakes floating in it like Cartel and other non-tequila spirits. To me, it just looks like sediment...not that appealing. But as you can tell from my review of Cartel that it didn't keep me from giving it an honest try and review. Let's do the same for this one. Aroma: A really faint nose on this one. And the linger in the nasal passages is kind of yeasty…if that even makes sense. Initial Taste: Very light. Some agave flavor and some peppery notes. Body: Thin bodied. Some vegetal notes come forward and that odd flavor from the nose is there too. It’s a bit off. Finish: Vegetal notes and black pepper on the finish. Maybe would pair well with fajitas. Hints of alcohol and mint as well. Not memorable, but not bad. 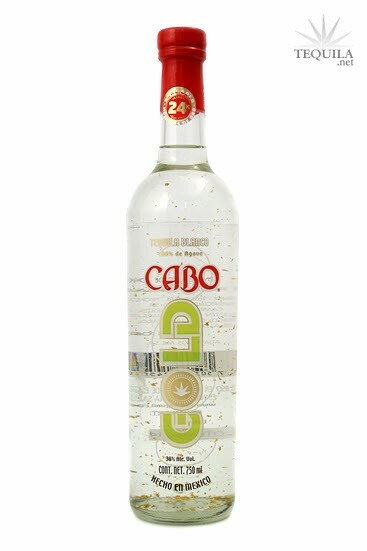 Cabo Gold is a light flavored and fairly watered down tequila. It could be that it's only available in Mexico which makes it 38% ABV. It does have some agave notes and some nice pepper on the back end, but overall this isn't one that I would rush out to get. It's a bit surprising because it's from NOM 1079 which makes a lot of tequilas that I've liked quite a bit. With all of the options out there, I think there's better value for the money than this Mexico only brand.